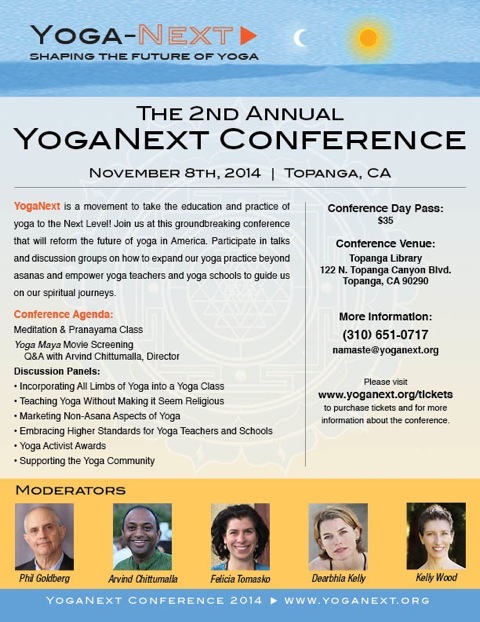 The 2nd Annual YogaNext Conference will be held on November 8th 2014 in Topanga CA. Venue is Topanga Library, located at 122 N. Topanga Canyon Blvd., Topanga, CA 90290. Conference day pass: $35. Please visit the “Shop” section on our website to buy a ticket for the conference. This conference will have talks and several discussion group meetings on subjects related to the mission of YogaNext and how we can help the yoga teaching community. Audience is welcome to participate in these discussions and offer their input. You do not have to be a registered member of YogaNext to attend this conference, it is open to all yoga practitioners, teachers and businesses. See below the agenda of the conference. 1.45pm – 3.15pm : Discussion Panel: Incorporating all limbs of yoga into a yoga class. Moderated by Dearbhla Kelly. 1.45pm – 3.15pm : Discussion Panel: Teaching yoga without making it seem religious. Moderated by Phil Goldberg. 3.30pm – 5.00pm: Discussion Panel: What more can YogaNext provide to the yoga community? Moderated by Nicole DeAvilla. 5.15pm – 6.45pm: Discussion Panel: How do we promote YogaNext to the yoga teacher community? Moderated by Arvind Chittumalla.